• Fix race condition that results in error 0xD0000018. • Fix error R6025 - Pure Virtual Function Call error when using Bitdefender with Advanced Threat Control. • Fix certain stubexes not having a digital certificate. • Fix the Shutdown process tree VM setting from incorrectly terminating the container if Startup script is used. 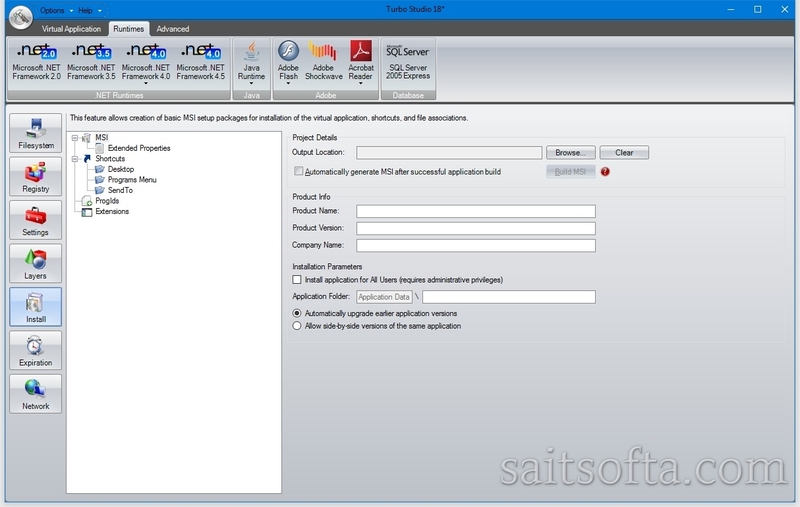 • Fix importing of packaged applications that have a Startup script. 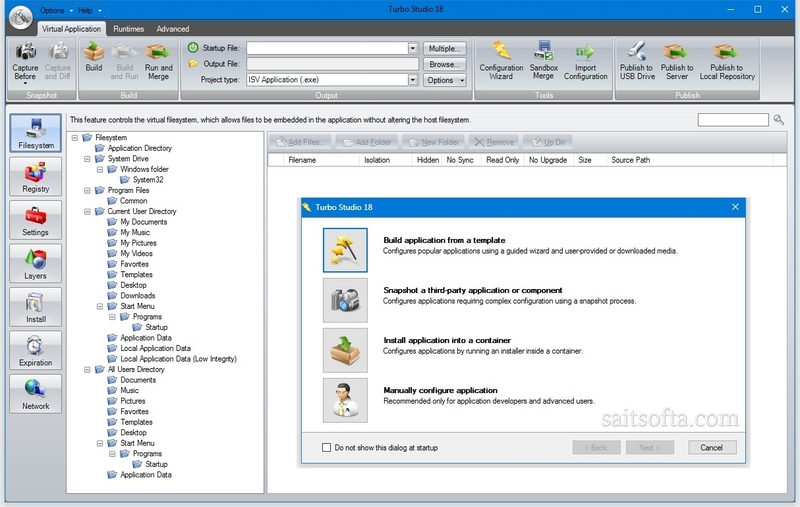 • Fix setting the correct startup file when importing an application from Turbo.net that has more than one image. 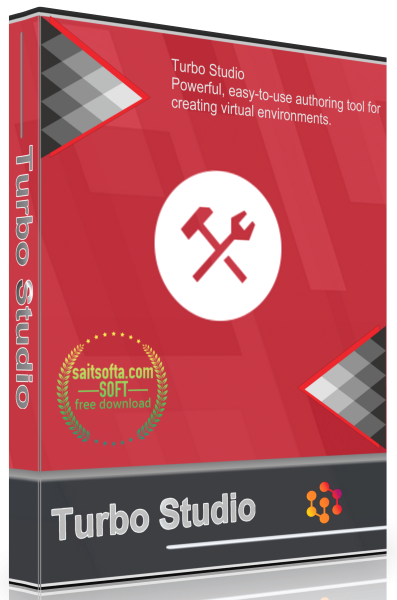 • Fix Turbo Studio title bar and minimize button. • Add support for Machine SID cloning to support Google Chrome settings synchronization. • Add support for Chrome's internal DNS resolver. • Add scroll bars in Network Panel > IP Restrictions when the list exceeds the viewable area. • Add support for TLS 1.2 encryption to XStudio command-line build tool. • Add help tooltips for project output types. • Improve the error message when a build fails because of a missing Layer image. • Improve snapshot compatibility by automatically excluding SideBySide\PublisherPolicyChangeTime registry values. • Fix the XStudio command-line tool to support network connections over TLS 1.2 for downloaded linked components and runtimes. • Fix uninstall entry for a Turbo-packaged MSI to display the application icon. • Fix IP Restrictions panel to show a scrollbar when the number of entries overflow the Studio window. • Fix exporting a configuration from an image where references to @SYSWOW64@ may be dropped if the path contains a resource ID. • Fix exporting a configuration from an image where the privatize flag is dropped. • Fix running the 64-bit version of PowerShell. Previously attempting to start a 64-bit PowerShell instance resulted in start of the 32-bit version. • Fix process hang during startup in rare conditions. • Fix process crash during application startup when SentinelOne security software is present. • Fix DeleteSandbox setting failing to completely remove all files on exit. • Fix WriteCopy registry isolation when running native installation of Office 365 in virtual environment. • Add ExtendedAppLockerCompatibility flag that disables AppLocker DLL rules that are incompatible with virtualization. • Add IsolateDDE flag to isolate DDE messages coming from outside the container. • Change default target architecture for configurations from x86 to x64. • Improve shutdown processing during ExitProcess calls.